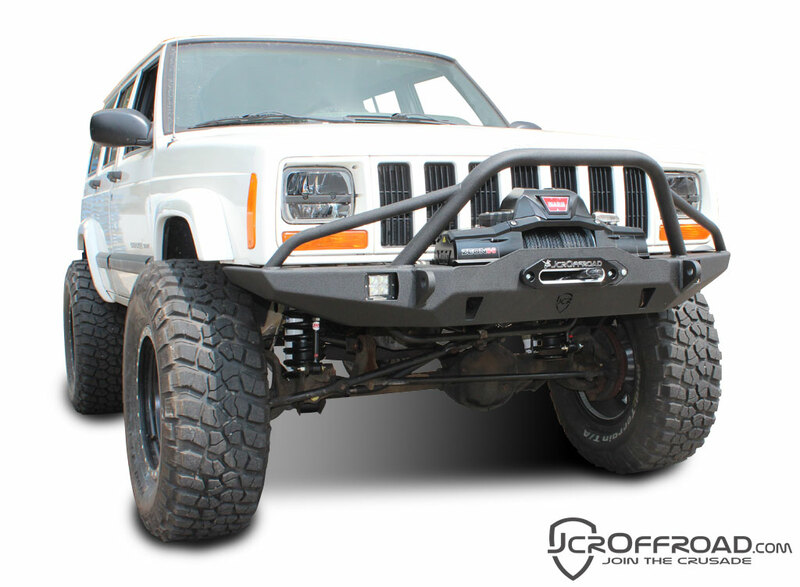 JcrOffroad is proud to announce a new Cherokee Winch bumper – The Vanguard! With the redesign of our XJ winch bumper, we’ve added the features our customers have asked us the most for. Higher clearance bumper ends and shackle tabs create to a lower front and side profile, as well as better approach angles. The bumper come standard with mounts compatible with most 3×3 LED cube lights. A higher center hoop on the prerunner creates a more modern look, while adding grill and radiator protection. And adjustable fairlead allows you to keep your cable centered on the drum no matter what winch your running; a centered Zeon, an offset Power Plant, or any other standard winch. New integrated Hi-Lift jacking points allow you to get out of a sticky situation without screwing up your powder coat. Uniframe tie-ins with bulkhead reinforcement. A steel steering box spacer to replace the factory aluminum one. Hardware kit including grade 8 steering box bolts. Plus shipping is free to the lower 48!